Conditions at the U.S.-Mexico border are every bit as dire as you may have seen or read about. How can we, as a nation, permit the human suffering of immigrants and asylum-seekers to continue? Whatever your opinions about U.S. immigration policy, treatment of asylum-seekers at the border is a national disgrace. My spouse, Kate Stewart, and I learned this firsthand when we traveled to McAllen, Texas, on Christmas Day to work at a bus station where asylum-seekers were being released from the Family Detention Center there. We were shocked and ashamed by what we witnessed. Like many Northwesterners, we had been feeling disturbed and powerless about the events at our southern border. We speak Spanish, have experience working in Central America and decided, “We have to go and do something.” We joined a local grass-roots nonprofit in McAllen, Angry Tias and Abuelas. Our job consisted of explaining complicated bus itineraries to asylum-seeking single parents and their children. Most of the 2,500 refugees passing through the bus station in late December were from Honduras, Guatemala and El Salvador. Bus tickets were purchased by sponsoring family or friends. The refugees carried envelopes with documents from Immigration and Customs Enforcement (ICE) authorizing their status and travel. Stapled on each envelope was a paper that read, “Please help me. I don’t speak English. What bus do I need to take?” In addition, we provided resources for immigration legal aid. Refugee families spontaneously told us what they had endured at the Family Detention Center. Repeatedly we heard that all entering adults and children are put into the “hielera” (ice box), a large room set at an unbearably cold temperature. They remain there up to nine days, most said at least six. Pregnant women, babies, toddlers, children and adults are in cells with 50-100 people, making lying down impossible. They told us they are given one piece of bread a day, and on good days it came with a piece of bologna. We heard multiple reports that the small amount of water given contained chlorine that burned their stomachs and made them sick. We learned that children 10 years and older are consistently separated from their parents. Several parents said their children as young as age 7 were taken from them as well. The separated children are put into another hielera adjacent to the adults who are still with their babies and younger children. 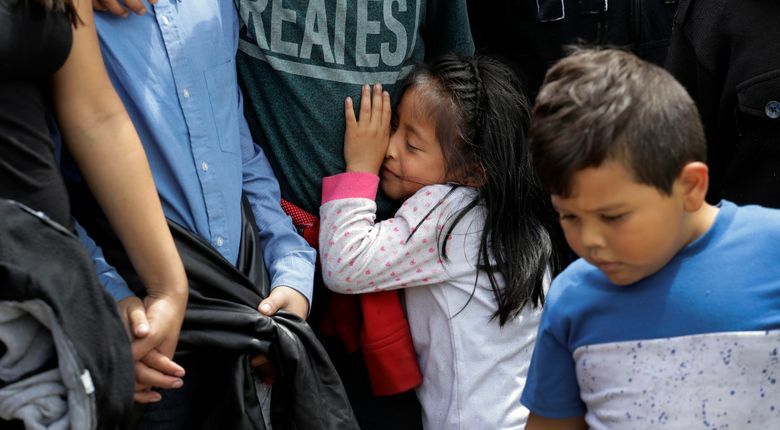 The separated children’s parents and others said they could hear them screaming and crying all day and night. The children are freezing, scared and hungry, as are the adults. Some reached the breaking point and fainted or became hysterical. We were told that when children are moved farther away in the center, some guards had taunted parents and said things like, “We’ve deported your child.” Ambulances would come and go. But to where? And were they transporting people who were ill or people who have died? Information about deaths at the centers can be difficult to access, even for news organizations or advocacy groups. The asylum-seekers we saw arriving at the bus station were seriously ill with respiratory infections, fevers and constant coughing. They were exhausted with bloodshot eyes. They were vulnerable, anxious, some shaking and crying, others numb and staring or stoically facing this next challenge. Some were euphoric to be free from detention and embarking on their journeys. Children were sometimes excited for the small toys given at the Catholic Charities Respite Center and the station Christmas tree; others were in a state of constant anxiety and fear, not able to be engaged and clinging to their father or mother. As American citizens, we experienced shame and outrage about this obvious cruel and inhumane treatment. The justification for this abuse is deterrence, to make detention so physically and psychologically intolerable that people won’t want to come to the U.S. Will this stave the flow of immigrants fleeing conditions far worse? Probably not. Investigations and credible oversight are needed immediately, as well as accurate and public reporting of deaths, health emergencies and abuse at the centers. Refugees seeking asylum are protected under international human-rights law: Why are they being punished? As a nation, and as private citizens, we must not permit these violations of basic human rights to continue. Deborah DeWolfe is a clinical psychologist and co-founder of Project Opportunity, a small nonprofit operating in Nicaragua. For more than 30 years, she maintained a Seattle-based private clinical and consulting practice.